put the car back in the air and shake the wheel up and down. meaning put one hand on the back of the wheel and put one at the front of the wheel and shake it. if you have movement then its a hub bearing. a new bearing probably will cost about $150 bucks. if you dont know how to check the front end out. take it to your closest sears auto center, because we do front end evaluations for free. jus make sure you ask for the list of things thats wrong with the front end. replacing a hub bearing will probably take you 30-60min. 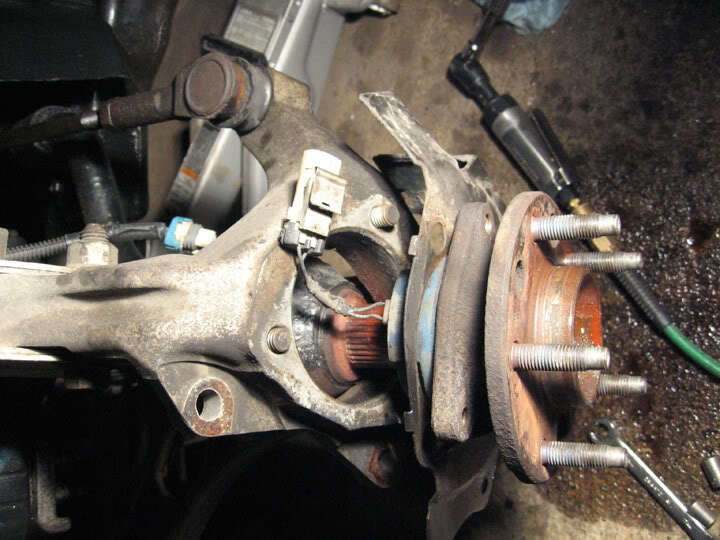 after that you will have to take to get an alignment done, because you would've taken apart the outer tie rod and strut from the steering knuckle. will probably require some force to free it from the knuckle....and a bit of force to slide the splined cv shaft from the spindle...i recomment a soft dead blow hammer or a piece of brass to pound against..so you dont mess the threads up.... then installaion is reverse..make sure to clean any rust an dirt from the mating surface .....pretty simple...and no alignment needed. this sound like a quick job, thanks guys I will let you know how it turns out. I can't seem to get the bolts free from the spindle, I broke 2 star sockets...they wont budge should I apply heat to them? rob you were right, you dont have to take the strut off, but i always unbolt the outer tied rod from the knuckle so i can turn the assembly to get to the bolts a lot easier. Well I found out my answer, so i'm looking for another 95-96 Rivi or Rurora. Good news- www.tripleedgeperformance.com's transmission is installed and is amazing! Bad news- damn driver's side wheel bearing hub went out on the drive home. 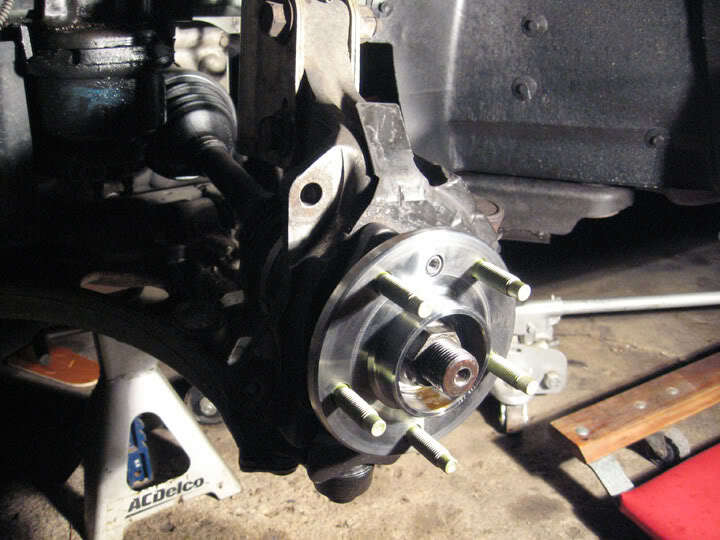 I have replaced hubs before on different cars but want to know if anyones done it on the Riviera. I would assume it is fairly straight forward but it's nice to know any tricks before I start. If anyone could provide a brief write up with a tool list, I would appreciate it. I just did this. I've seen two different approaches - some drop the lower ball joint and pull the strut outwards. 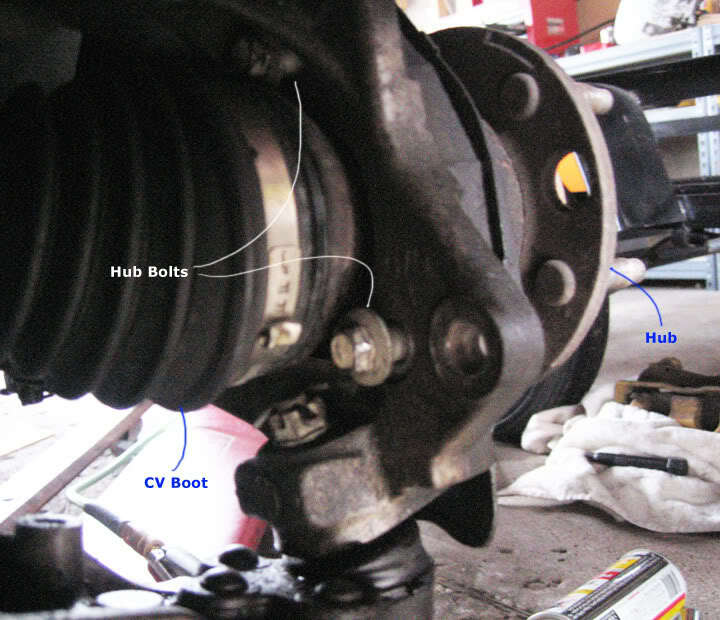 The book says to leave the lower ball joint attached and somehow get behind the outer CV joint to loosen the bolts. I don't see how that's possible but that's what the book says... I took the approach of seperating the lower ball joint, I think it's easier that way. Also, my car is a '98, I know some cars had big torx bolts but mine didn't. I think you'll find all sizes the same. 2) remove wheel (19mm), spray penetrant on axle nut threads. PB blaster is one that works well. Spray liberally 1 hour before for best results. Repeat use every few minutes during the removal procedure. 3) caliper (15mm) These bolts can be stubborn. Impact gun recommended, or you can take a small jack and push "up" on the end of the ratchet. At least this works on one side of the car. 6) with soft hammer, knock axle inward to free splines. (don't try to remove, just free it). If you don't have a soft hammer, put the nut back on flush to the end of the axle to protect the axle's threads. In fact, if you don't have a soft hammer I'd be reluctant to try it this way. I've found these hubs can be a PITA to get off. In my case, the axle was basically welded into the hub. If your bearing is going bad, chances are it gets very hot when spun, so it can seize to the splines over time. You can rent a puller tool from Advance Auto Parts for free, but I've managed to break them on two separate occasions. Below shows the tool in operation. BEWARE: when you use this tool, lots of force is involved, so something's got to give: 1) the axle (hopefully), 2) the lugs/nuts, or 3) the tool itself. Wear eye protection, and stand clear! 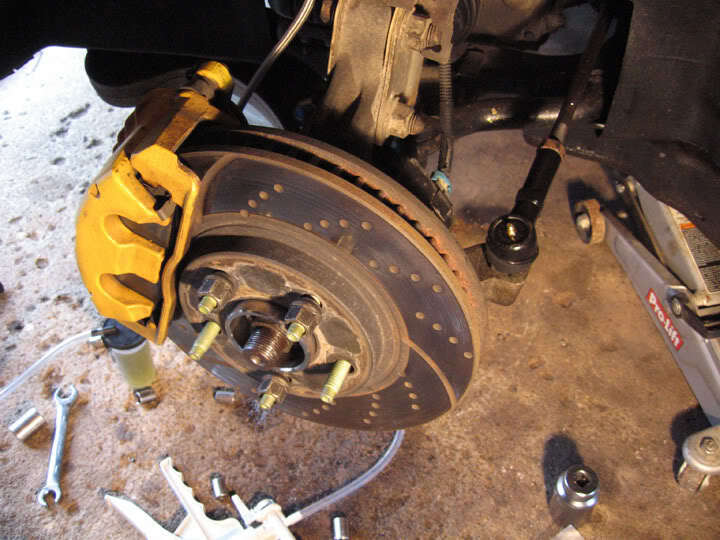 I was sitting beside the wheel once, tightening the tool, when a lug nut broke away from the lug and hit me right in the chest with considerable force. Had this been my face, I might have been knocked unconscious. If the above tool doesn't seem to work, or you don't have one, try the soft hammer. If that doesn't do it, take a small sledge and tap the axle in with the nut on the end to protect the axle threads, per deekster's instructions. Do not pound on the end of the axle without the nut in place, or you likely will not be able to thread the axle nut back on. 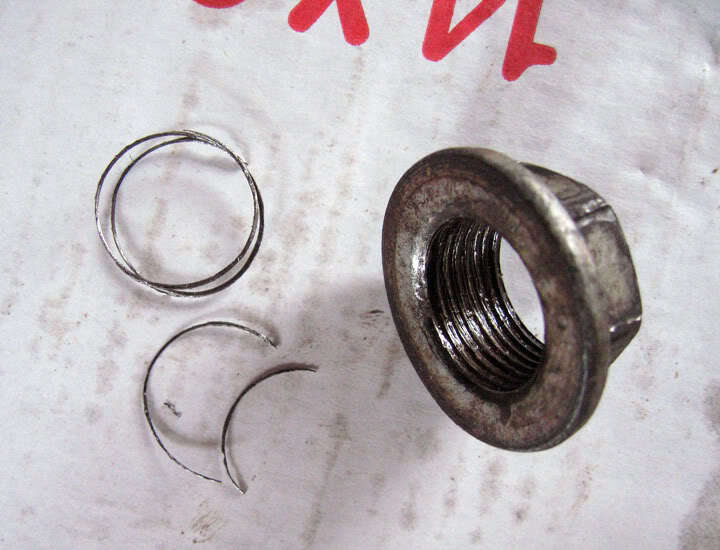 Not to worry, the threads are from the nut, not the axle. 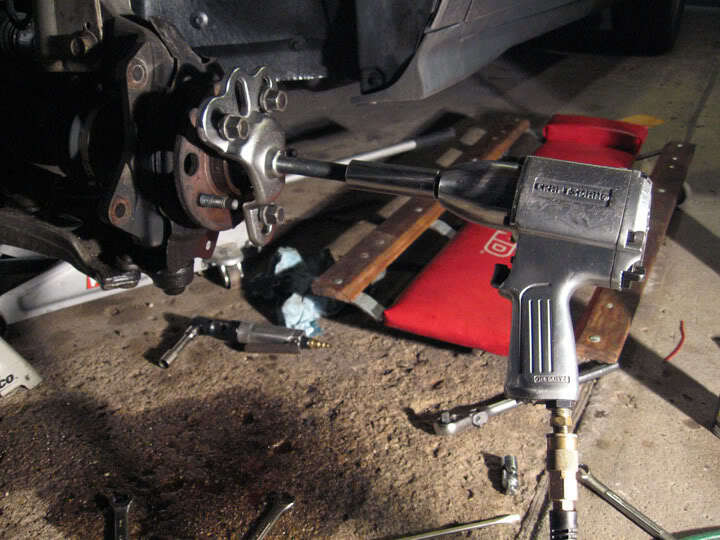 7) lower ball joint - remove cotter pin and discard. 18mm open end to undo castle nut. with nut removed, tapping around just right with a hammer frees the ball joint... I did not do steps 7-8. 8) pull bottom of strut out away from car, knock axle inward with soft hammer (it's a plastic hammer, right?). When CV joint is free, swing it out of the way. 12) install new bearing. I like to use loctite on bolts but it's not called for in the book. 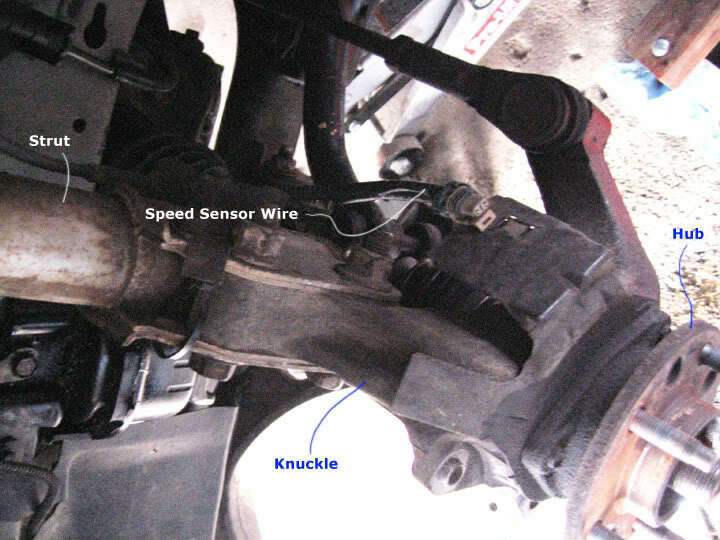 tighten to 70 lb ft. Be very careful to route speed sensor wires through steering knuckle. The back side of the knuckle is sharp, so watch the wires don't get pinched. 13) Spray CV joint splines and threads with WD-40 for reassembly help. 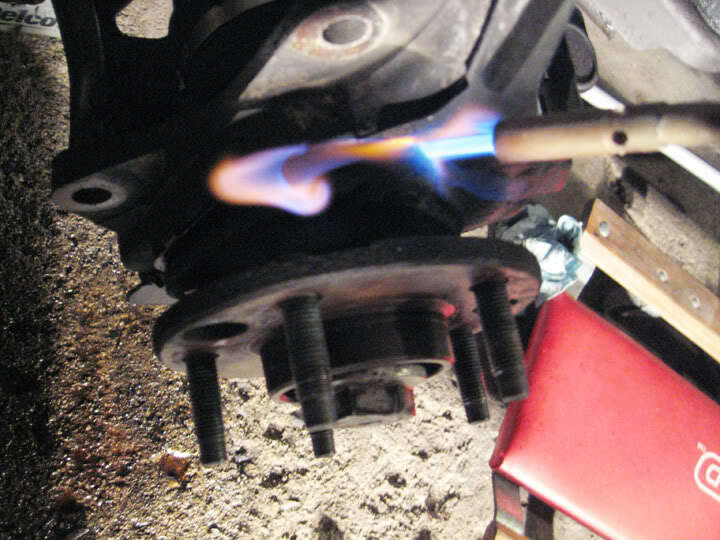 pull strut outwards and squeeze that CV joint back into the new bearing. 17) Caliper - I compress the piston with a 6" C Clamp. Put new anti-squeal on back of old pads. Bolts to 55 lb ft.
18) Wheel. Lug Nuts to 100 lb ft. Be sure to reconnect the speed sensor wiring to the hub! 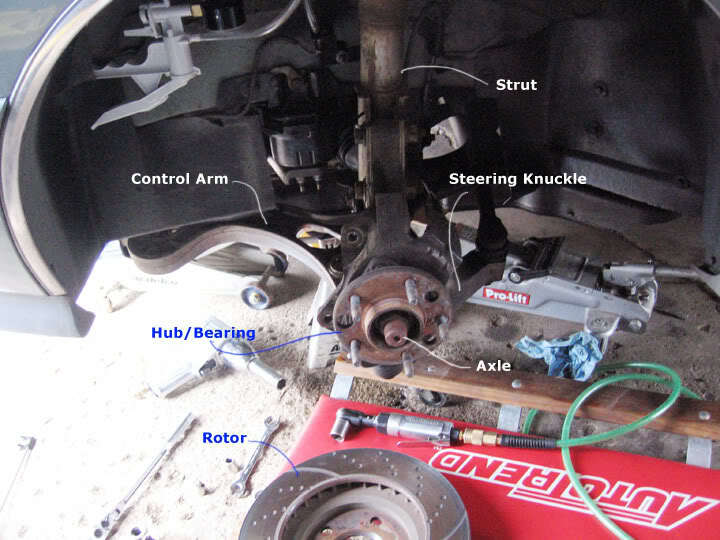 19) After a couple days of driving, retorque the axle nut to 107 lb-ft. Check again in a week or two - it's easy to do. I'm not 100% sure about the caliper and wheel bearing bolts. Looking for them in shop manual, will edit later. Hmm, still need to confirm those two torque specs, plus I forgot to write about the ABS wires. It's just unplug/plugin, depending on the bearing you got you may need to do something with the wire holding clip. I understand the wheel speed sensors are part of the hub assembly, and if youy have a bad hub, then likely the wheel speed sensor could be damaged. And they are integral part of TC and ABS. That's probably why my TC would engage anytime I tried to go somewhere for the past two days. I ended up having to turn it off everytime I had to drive. I've done this twice on the Riv. It's very easy if you know how. No need to remove the ball joint on my '98. Just loosen the hub and smack the axle with a hammer. I think you can also use a tool to push the axle in. 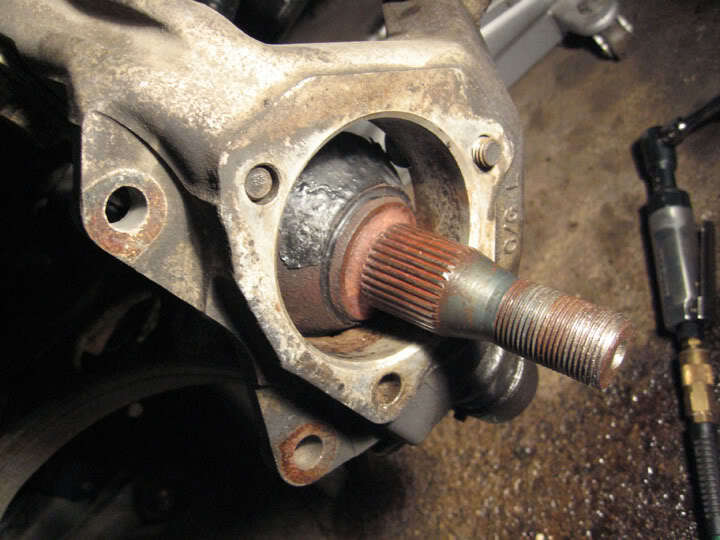 1) Keep the axle nut on the end when you pound it through - to avoid damaging the threads. Get a new axle nut for $1 if you need, but protect the end of that shaft! 2) Disconnect the sensor wire before anything, and keep track of it so you dont get it caught, pinch or sever it during install. Mine has been soldered and heat shrunk because some idiot (me!) didn't pay attention. Are you guys sure that the axle nut is 1-3/8" I just bought a 1-3/8" socket and it's really loose. I put as much pressure on it as I could with the breaker bar and it didn't budge, and I don't feel safe adding a cheater bar and putting more pressure on it. Sounds familiar to me. It's actually metric, so if you are buying a socket get the right size. It's probably around 33 mm or so. I only used the standard size because it's what I had. You do need to put a LOT of force on it. IIRC 1-5/16 is too small and 1-3/8 is a little loose, but will hold. Yeah, I went and picked up another socket and they let me go out to my car and fit it. 1-5/16 is still a little big, but would probably work. You're right though, 33 mm is the correct size. okay, wow, what a PITA. I got the axle nut off, the three bolts out, and for the life of me I can't get the hub off. I tried using a few different pullers that I have (had a load of pressure on it and it didn't budge). While the puller was on I tried using a big slide hammer to try to knock it loose. No dice. Is there anything that I haven't tried that might work. The bearing is definitely shot. It grinds really bad and the car shakes a little when I brake. It was like this when I bought the car, so I have no idea how long it's been this way. Please help!!! the last thing I wanna do is put everything back together and take it to the mechanic and pay $50 per bearing to have the new ones put on. Especially after I just spent $30 on tools. Mine have three bolts. I have the replacement bearings right here :/. I tried smacking it with a BFH quite a few times and that did nothing. Looks like I'll be taking it to the mechanic. Mine have 3. I had to whale the F out of them with a sledgehammer from the back to get them out.